Beneath the thrum of freeway traffic, Michele Magobet shuffles past a foldout table. Pausing to examine plastic tubs, she picks out a tiny candle, alcohol swabs, a handful of hypodermic needles. At a second table, Magobet grabs a paper bag containing a turkey sandwich, granola bar, and juice box. A group of volunteers stands nearby, sporting studs, tight black jeans, and mohawks. This is Punks With Lunch, a patchwork group of friends that offers free weekly meals and a needle exchange for West Oakland’s homeless. Alejandra Del Pinal and Ryan Dal Porto, the group’s founders, have struggled with substance abuse and homelessness themselves. Their pasts are part of what drove them to start the program. “I’m not looking for redemption or anything, but I definitely want to help out,” Del Pinal said. 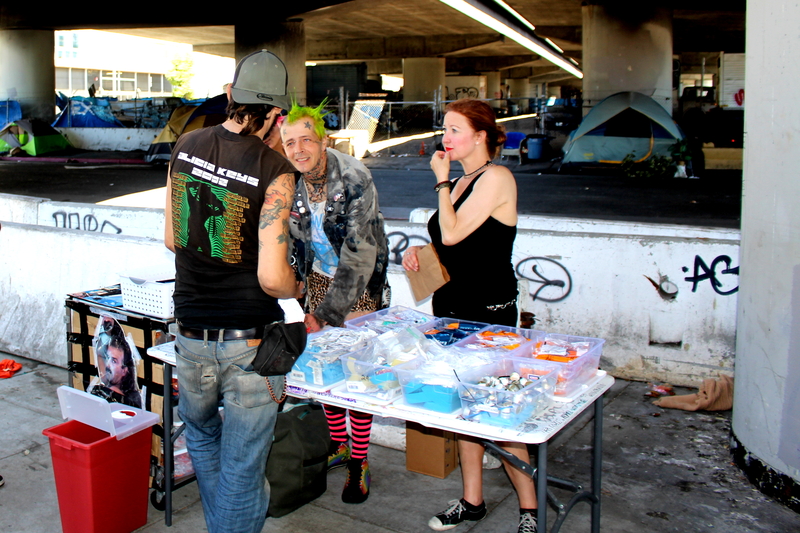 Punks With Lunch has been distributing food, hygiene products, and clothing in the city’s homeless encampments every Sunday for nearly two years. The group operates out of a West Oakland warehouse and drums up donations from underground punk rock benefit concerts and online fundraising. In April, Punks With Lunch merged with Community Outreach Harm Reduction Team (COHRT), a local DIY needle exchange started by Dal Porto. In addition to meals, the group now provides drop-off sites for used syringes, harm reduction education, and Narcan—a drug that helps stop or prevent overdoses in opiate users. Ben Rubin looks on as his mother, Paula Rubin uses tongs to pick up a used syringe near a tent encampment in West Oakland. Both are Punks With Lunch regulars. Photo by Brian Howey/Bay News Rising. Loris Mattox, executive director of HIV Education and Prevention Project of Alameda County (HEPPAC), said the idea behind harm reduction is that drug abuse is inevitable and minimizing its negative effects is far more important than ignoring or condemning the behavior. For those who use illegal drugs, she said, harm reduction means education about safer use and disposal of needles and pipes rather than punitive retribution. 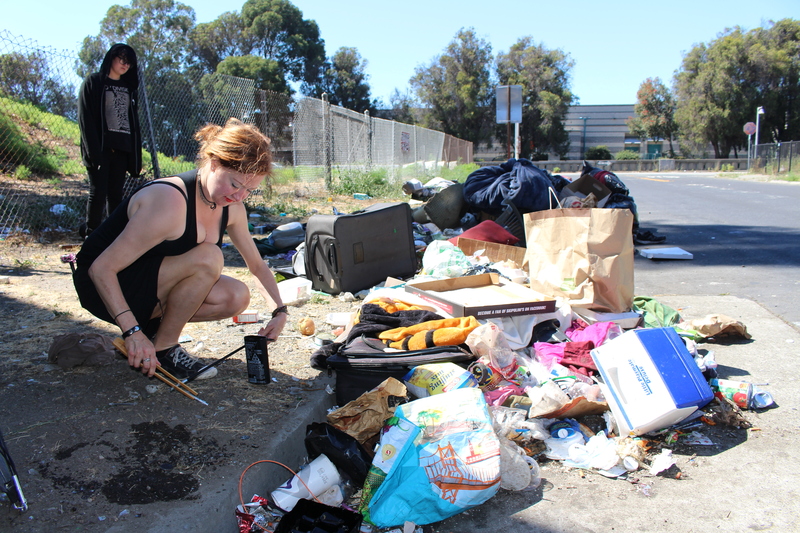 Since COHRT and Punks With Lunch merged, more than 10,000 used syringes have been turned in and more than 4,000 collected in regular needle sweeps around tent encampments and parks. 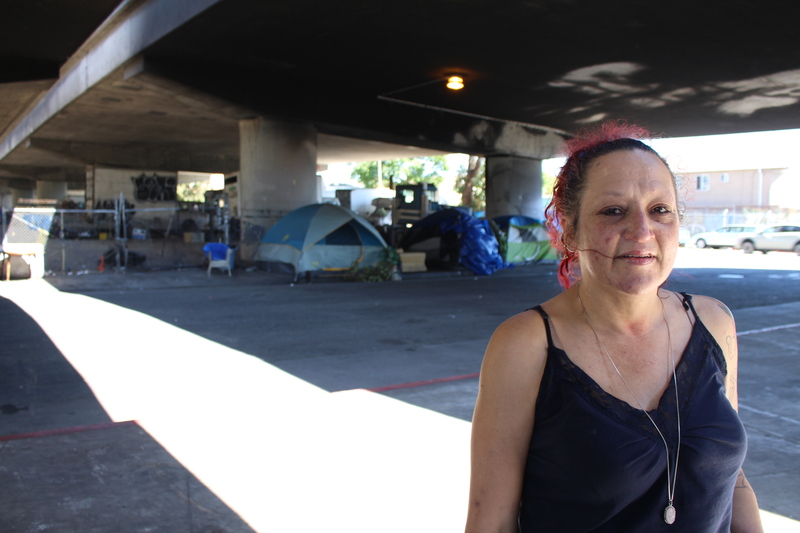 Homelessness in Oakland troubled Dal Pinal. Punks With Lunch was her response. She gathered some friends from the punk community, each of whom threw in $20 for groceries. On their first day, Punks With Lunch made 40 sandwiches. Now they make 120-180 lunches every week. A steady stream of online donations means volunteers no longer have to pay out of pocket for groceries. Attendance fluctuates week to week, and sometimes less than a handful show up. Ryan Dal Porto and Paula Rubin talk with a man who has just turned in his used syringes to Punks With Lunch. Photo by Brian Howey/Bay News Rising. Now seven years sober, Dal Porto teaches people how to safely dispose of their dirty syringes and organizes needle sweeps in hot spots like tent encampments and parks. Del Pinal has used opiates in the past as well, and she said a sense of responsibility keeps her motivated to continue the program. At one point she sold pills to friends. Some of the friends she used to sell drugs to are homeless addicts now, and use Punks With Lunch’s services. That brief period during which she sold pills to friends “had a huge impact” on her perception of drug use, she said. Needle exchange programs became eligible for federal funding in January 2016. Seven months later, a report by the Centers for Disease Control Prevention (CDC) stated that needle-syringe programs reduced occurrences of HIV and hepatitis C infections. But Mattox said that when she started working for HEPPAC in the mid-’90s, politicians in the Bay Area were largely opposed to such programs. I was told back in the day that we were committing genocide, that our services were killing communities,” she said. Michele Magobet stands in front of a tent encampment in West Oakland. She and her boyfriend are homeless. Photo by Brian Howey/Bay News Rising. For now, Punks With Lunch is focused on expanding its volunteer base and offering services more frequently. Currently, the group offers food and needle exchanges every Sunday afternoon at Fifth and Brush streets and at 35th and Peralta streets. Needle exchanges are also available 6-8 p.m. Wednesdays at Grove Shafter Park on Martin Luther King Jr. Way. The founders hope the group will eventually register as a 501(c)(3) nonprofit. They envision a future for the organization that includes an office providing methadone and Suboxone referrals to recovering addicts, and a cadre of caseworkers to provide resources and assistance for individuals. As afternoon shadows stretch across the busy intersection, the Punks With Lunch team packs up its tables and heads off to its second stop to hand out the remainder of its lunches and distribute more Narcan. Magobet watches the neon mohawks disappear. When they’re gone, she walks back to her tent, holding a paper bag in each arm. One bag will ease her hunger for the day, the other may keep her alive another day. This entry was posted on July 1, 2017 by Bay News Rising and tagged bay area, charity, drug use, HEPPAC, Homeless, Homelessness, needle exchange, non profit, Oakland, Punks With Lunch. COHRT.